AN embedded tropical low on the monsoon tough produced very heavy falls in the Gulf Country and Queensland’s northern interior. The highest weekly total was 505 mm at Paluma Ivy Cottage, north-west of Townsville in Queensland. 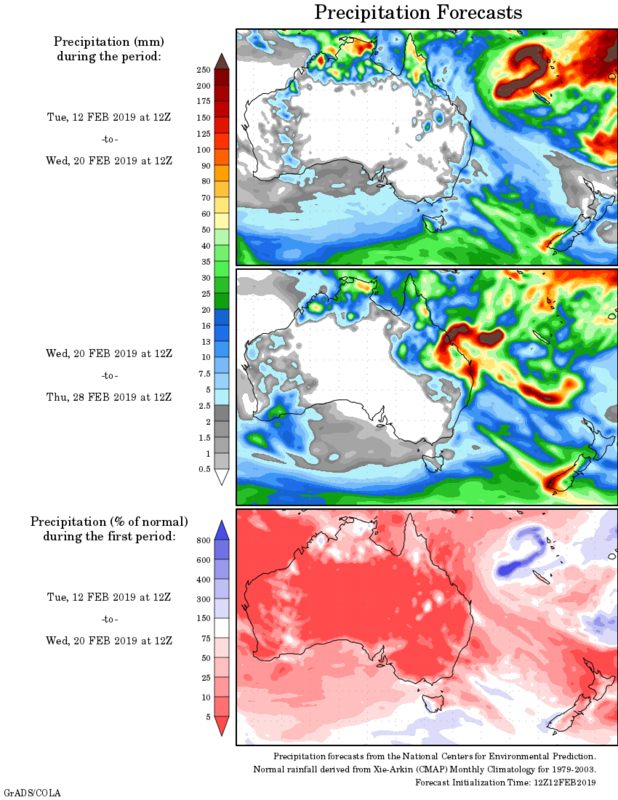 Past seven days: At the start of the week, a tropical low embedded on the monsoon trough deepened over north-western Queensland, and increased monsoonal flow across northern Queensland. Very heavy falls were recorded around the gulf country and northern interior, with major flooding in the gulf rivers, including the Flinders River. Rain areas, showers and thunderstorms produced moderate falls across much of the northern and central districts of Queensland, with the heaviest falls over the Herbert and Lower Burdekin District around Townsville, and Queensland’s central coast. An onshore flow persisted until mid-week, along Queensland’s central and south-east coast. Showers and thunderstorms developed along a surface trough over the Top End of the Northern Territory; and the Kimberley, Southern Interior and Goldfields Districts in Western Australia, generating moderate falls. Further south, a surface and upper-level trough enhanced rainfall and thunderstorm activity across south-east Australia, with moderate falls in parts of central, southern and eastern New South Wales, Victoria and most of Tasmania. By the middle of the week, the monsoon trough had finally weakened and shifted eastwards, with the tropical low moving offshore. Moderate to heavy falls contracted to the Cape York Peninsula in Queensland. Seasonal thunderstorms were also recorded across the Top End in the Northern Territory, and the Kimberley in Western Australia. In the south, a cold front and pre-frontal trough tracked across southeast Australia, and generated moderate falls from central to eastern New South Wales and western Tasmania, and widespread light falls were recorded across eastern Tasmania, much of Victoria, south-eastern South Australia and north-eastern New South Wales. In the last part of the week, isolated areas of thunderstorms developed over the north-west of the Northern Territory–Western Australia region near Kununurra; also in the tip of the Cape York Peninsula and along Queensland’s east coast. In the south, a strong cold front tracked across the south-east, embedded in a northwesterly flow. Moderate falls were record in western and northern Tasmania. Rainfall totals in excess of 200 mm were recorded in Queensland’s northern interior, elevated areas of the Herbert and Lower Burdekin, the central coast and far northern tip of the Cape York Peninsula. The highest weekly total was 505 mm at Paluma Ivy Cottage, northwest of Townsville. Rainfall totals exceeding 100 mm were recorded in an area of the Darwin–Daly district in the Northern Territory, the northern Cape York Peninsula, an area from the northwest to north tropical and central coasts of Queensland, and in a small area of the north-west and the north-east of Tasmania. Rainfall totals between 50 mm and 100 mm were recorded in parts of the Kimberley in Western Australia, the Darwin–Daly and parts of the coastal Top End in the Northern Territory, across much of northern Queensland, small areas of central and south-eastern New South Wales, far eastern Victoria, and in western and northern Tasmania. Rainfall totals between 10 mm and 50 mm were recorded in remaining parts of the Kimberley, and southern inland Western Australia; most of the top third of the Northern Territory’ along Queensland’s east coast south of Rockhampton; most of New South Wales except in the northwest; most of Victoria; southeastern South Australia and remaining parts of Tasmania. Little of no rainfall was recorded along Western Australia’s west and south coasts, as well as most of the State’s interior; the bottom two thirds of the Northern Territory; South Australia away from the south-east; western and southern Queensland, and northwestern New South Wales.